In twenty-four hours, she's lost her job and her boyfriend. 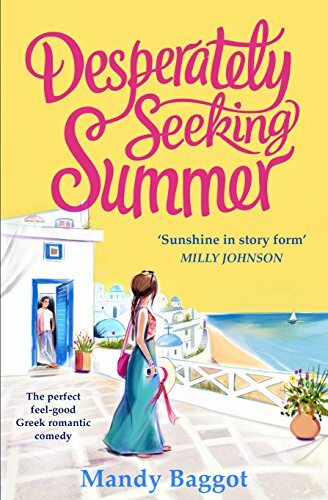 Single and with nothing left to lose, she's headed for a Corfu escape to spend time with her family while she heals her broken heart. I'm utterly bereft that I have come to the end of such a fabulous book it had everything you could want from your perfect summery read and more. There was Theo who I fell in love with, Abby and her mad family's vision for a pink estate agency in Corfu, there is greek food, beautiful scenery, high drama, sizzling chemistry, plenty of smiles and laughs, and so much more. This is escapism at its best. I could wax lyrical all day about this book, but I fear I would bore you, so instead I will try and keep this short, and just tell you, especially if you are already a fan of Mandy Baggot to just go and buy this and read it for yourself. It won't disappoint. If you have never read a book by this author before, well frankly you are missing out, but she has a fabulous back catalogue to catch up on too. This is a story of Abby who manages to lose her job, boyfriend and her cat all in the same day decided to spend some time with her family in Corfu, only to arrive and discover their estate agency isn't doing too well. So while Abby is trying to help save the family business, she comes into contact with Theo, who is using Corfu as a summer escape for himself too. Of course there is more to Theo than there first appears, and thanks to the way the book is written we often get sections focusing on him, and thus can see beneath his amazing good looks quite early on. There is romance in the air in Corfu this summer and not just for Abby, and the villagers of San Sebastian are all colourful characters and I enjoyed meeting a lot of those too. There are business rivalries, interesting ways of trying to keep the Dolan family afloat and older relationships revitalised. I even think I learnt a bit of Greek in this book, as occasional words are used, most of the time you could guess the meaning from the context, and if you can't then there was a handy glossary at the back too. I can't stress enough how much I enjoyed spending time in Corfu with Abby, Theo and their friends and family. This is a fantastic book to while away a hot summers day, or a cold winters one when you are wishing you are somewhere warmer! Thank you to Netgalley and Ebury for this copy which I have reviewed honestly and voluntarily.